Love Your Human Design » Wired for Song? Carole King is a prolific song writer. She learned to play the piano at a very young age and the music has flowed out of her ever since. She has written scores and scores of hit songs for various artists and has had multiple billboard hits, #1 songs and #1 albums. Where does all this music come from? Some might look at her Human Design and see she is wired for song. 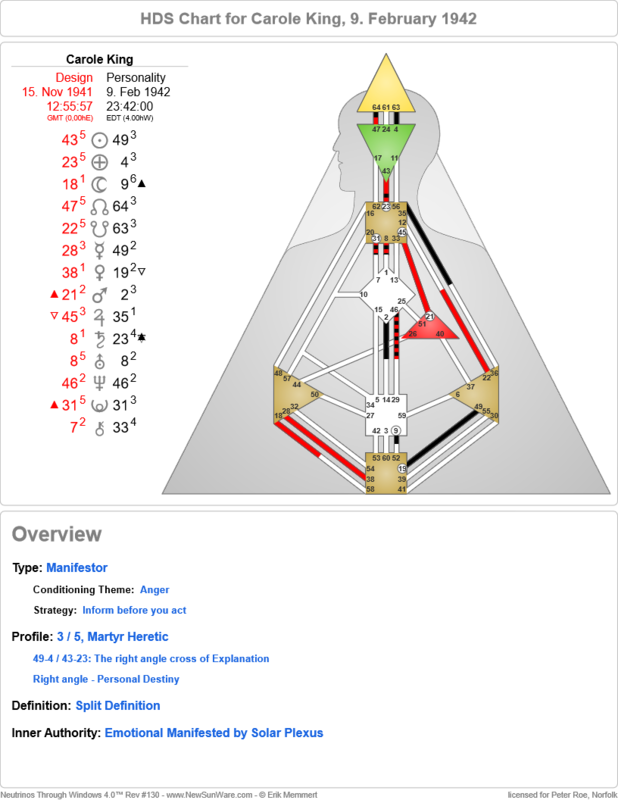 If you look at the structure of her Head, Ajna and Throat, it takes on the appearance of a funnel. The energy is just flowing from inspiration or thought from the head, is processed by the Ajna and popping out the throat. Remember, the throat is about all expression, so that includes the notes from her piano or any other instruments she might call in. The 43-23 reminds me a bit of a gumball machine. You pour ingredients into the mind and something is going to pop out, like you just put in a penny, ok in these days a quarter, the energy just pops out in some sort of expression. The interesting thing is the 43-23 is unique and individual in it’s expression so people don’t always get it. In Carole’s case, her early career was working with her husband Gerry Goffin, who wrote the lyrics and at the direction of Don Kirshner, whose direction probably helped shape the product into timely melodies and songs. But I digress, back to the mind which is the combo of the head and the Ajna. Carole is wired with both sides of the brain so she can take a logically progression of chords and add abstract combinations and continuously mesh these together to produce a song. Certainly, this has been an ally in her long and prolific career. Carole and Gerry wrote a number hits for band like the Shirelles, the Drifters, the Monkees, James Taylor and Aretha Franklin. Interestingly, while she did record a few singles, these did not amount to much and she stopped doing it in the mid 1960’s. In 1968 she divorced her husband and moved to California with her daughters. It was in this new environment that she began a solo career in early 1970’s. One might look at her undefined identity and speculate before that she saw her identity as a writer and not necessarily the performer. Once Carole saw herself as the singer performer, her career hit another level. Her 1971 album Tapestry, is a master piece and considered by Rolling Stone Magazine to rank #36 in the top 500 albums of all time. In December of 1971 she released another album Carole King: Music which also reached #1 in the charts and both Tapestry and Music were in the top 10 at the same time. How many artist can lay claim to 2 albums in the top 10 at the same time. So here is how her other design energies support her. When you add to her mind, the power of her will that makes her a Manifestor, you have the creative spark to make it all happen. When you fold in the 3rd line experimental nature of her profile, you have the energy to try to mix it up to help create the great combination of notes and rhythm. When you also fold in the magnetism of the 5th line that can draw people in, that can project the feeling, thoughts and ruminations, you have that magic. In addition, she has the channel of the game player of life(28-38), that could work through the struggles of a failed marriage and find a deeper meaning. She also has the channel of revolution, (19-49), that can ride along when things are working, but when it is not, looks to revolt and make a change like the one she made when she moved from New York to California. The revolution is also amplified by the gate 35 that is done when it is done. So was Carole King wired for song, I would say, “You bet!”, just look at that chart!